Nest description: twigs, grasses and debris. May be primarily of slender, dry stems with small leaves attached, lined with soft, wooly branch tips. May contain grass stems, plant fibers, leaves, rootlets, hairs, string and wool, lichens. 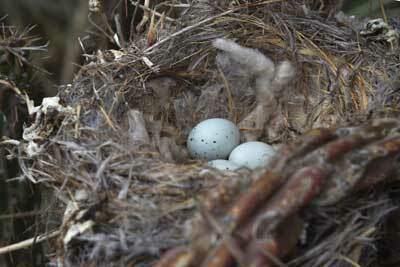 Sometimes nest in wreaths on doors of houses - see photos. 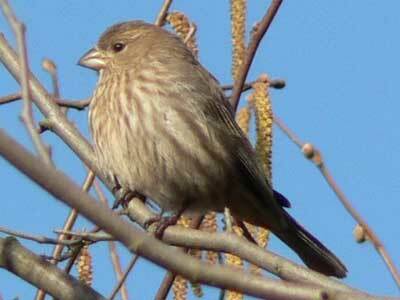 Not typically found in nestboxes, although they may use slot boxes and metal Purple Martin houses. Eggs ypically oval, smooth shell, slight gloss, pale bluish white/green with sparing, delicate black (or dark brown or olive) spots/dots, speckles or streaks on the large end of the egg, forming a fine, loose ring. Occasionally eggs are unmarked. Length may vary. Eggs are typically laid in the early morning, with the first one a day or several days after nest construction ends. 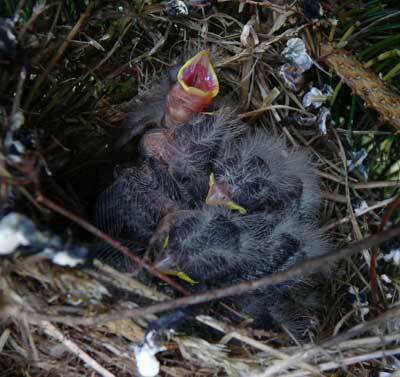 Newly hatched babies are naked except for fine, white down along feather tracts, with pinkish/yellowish looking skin, a yellow gape and red mouth lining. Bet Zimmerman photo. Notice the yellow gape with red mouth lining. Bet Zimmerman photo. 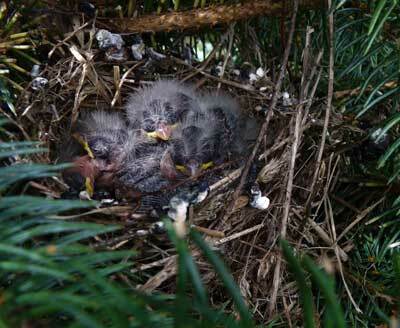 After nestlings are 5 days old, they defecate on the edges, creating a filthy mess, in a halo or wreath effect. 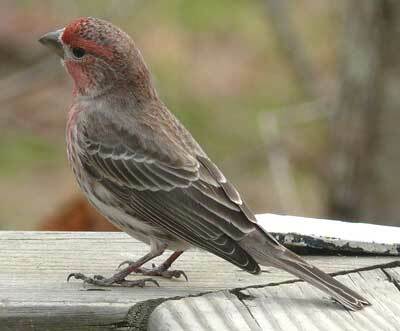 The pertinacity with which the House Finch clings to a chosen nook about a house when their nests are destroyed is amazing, and is equalled only by the English Sparrow.